Winter is a cold and quiet time where people gather indoors, drink hot cocoa or coffee, and maybe reflect on the year before and ahead. But Christmas in the city always gives us something to get out and about and see?Christmas illuminations. The Lighting Detectives gathered in Roppongi to shake off some of those winter blues and experience the new trends in Christmas illuminations. 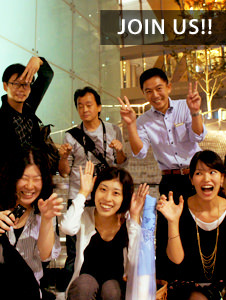 We tackled the big two: Roppongi Hills and Tokyo Midtown. The theme for Tokyo Midtown was “Someone is always Santa Clause for someone else;” a lovely theme, but not very decipherable from the illuminations. A quick overview includes a sparkling rendition of the aurora borealis in the Plaza, a colorful display of stained glass in the Galleria, and a brilliant blue Milky Way in the Garden. 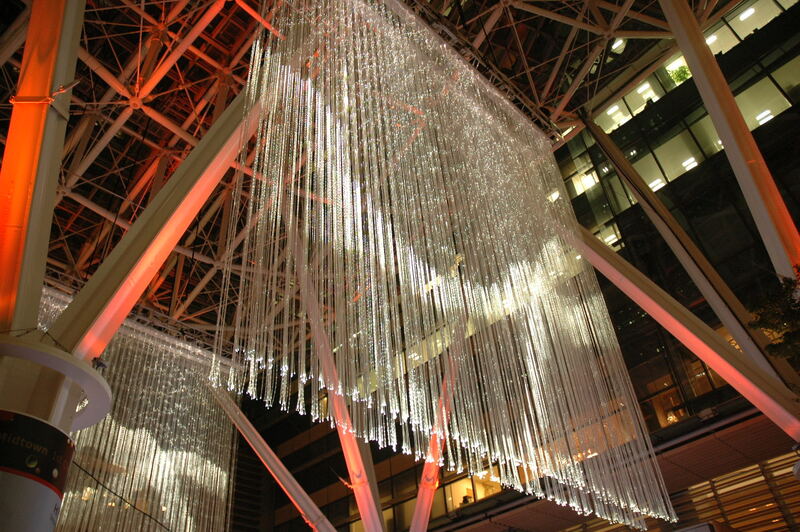 In the image of the northern lights a dangly curtain of waves and motion was hung in the plaza. The installation seemed more crystal-like as the lights where mostly white colored. In the Galleria the Kiriko tree of cut stained glass continually changed colors and seemed to gather the most attention. At 8m tall it was quite impressive and visible from the far end of the garden. 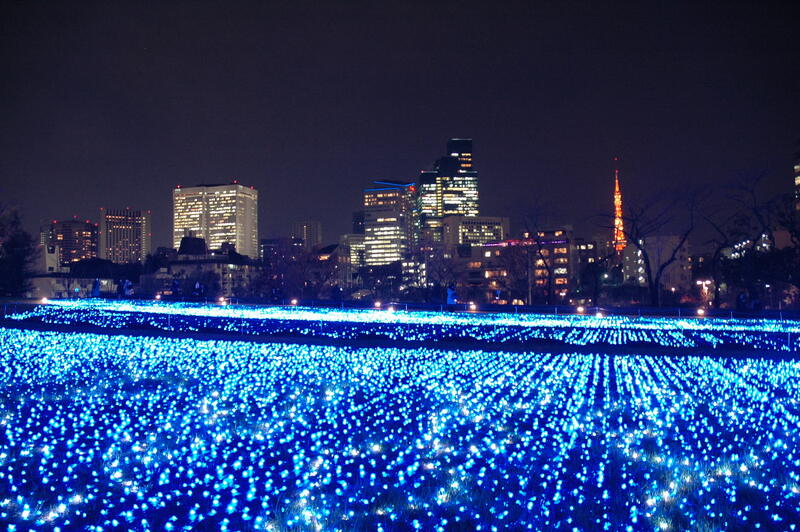 The ocean of little blue lights that covered most of the grassy area in the garden was actually the Milky Way with swirling stardust and shooting stars, all accompanied by music. Now this might have been a great place to have that cup of hot coffee and reflect, but it was just too bright and unsettling for my taste. Although most of the lights used were LED`s, the eco in me knows that there has to be a wiser use of light and definitely something friendlier on the eye. 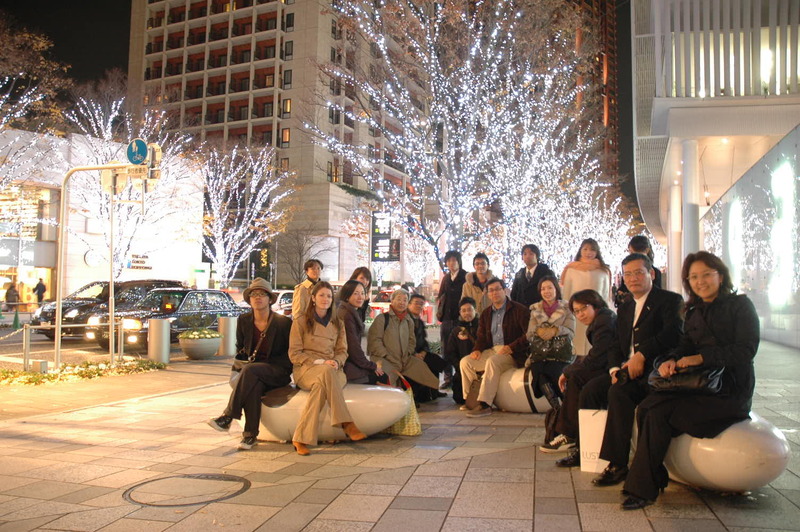 From here we left the rookie venue behind and wandered over to Roppongi Hills with a simpler, but equally mysterious theme of “Artelligent Christmas.” The 66 Plaza was decorated in red; red lights for the trees, red spotlights, a red Christmas tree, and red “candlelight” in the Japanese garden. 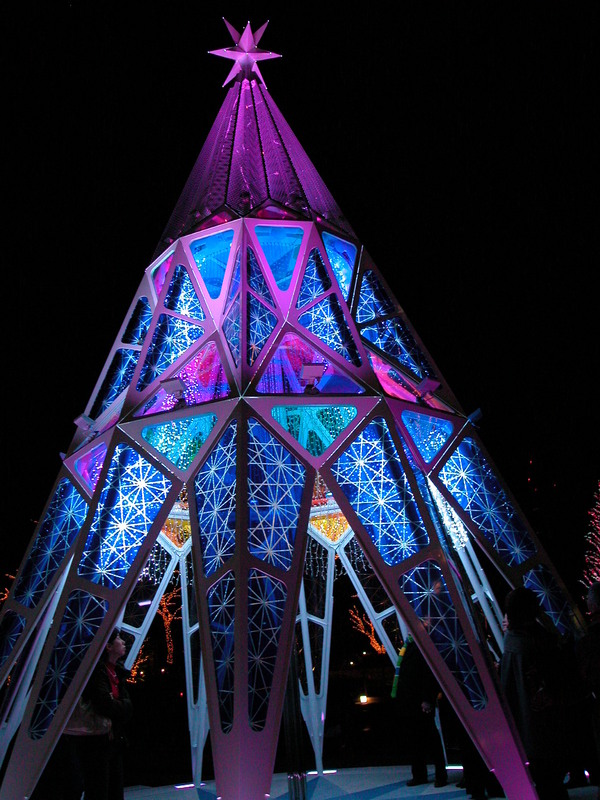 It was a new experience, as most Christmas illuminations tend to be white or orangish. Some on the walk thought all the red was overkill, but I figured a red filter added to the Spider spotlight in the plaza would top off the ensemble and create interesting color shadows. 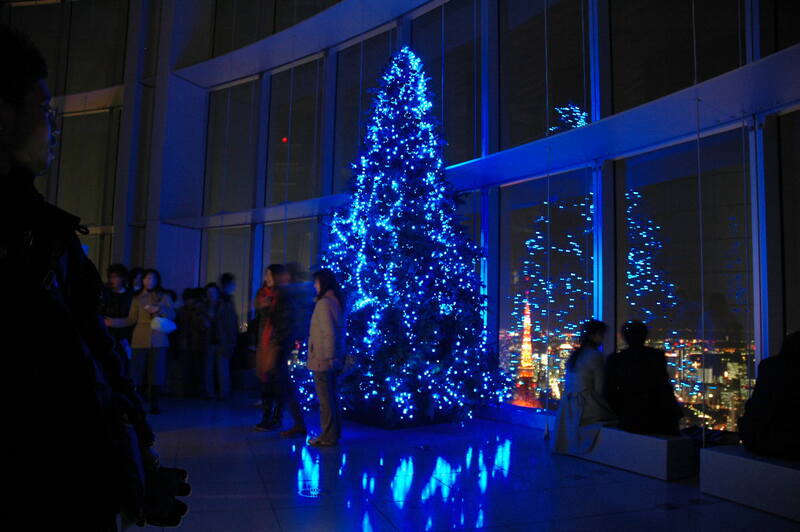 Up on the 52nd floor the Tokyo City View observation deck was decorated for the holiday season with a variety of lighting elements; all of which reflected in the glass windows, but didn’t disturb the view too much. Whether Christmas or not, this view is spectacular and always generates a tingle of excitement. As the 20 plus group of us trooped through these two complexes and invaded the privacy of the many couples that had come to uh and ah, I realized that simple is best. The display of lights for Tokyo Midtown`s 1st Christmas was very explosive and at times blinding, but I think I prefer a more modest expression amongst all the pizzazz that comes with life and this commercialized holiday season. The unified red front of Roppongi Hills was more my style. The simplicity of a one-color scheme left a bigger impression and less “messing” definitely results in a more elegant show. Although, it is unfortunate that something more unique and trendy wasn’t designed for this popular area. Oh, and it is probably better to go with that special someone, rather than a group of analytical lighting detectives, spoils the holiday mood!